Fifi will definitely be willing to paint any of your pets... send me an email!!!! SPECIAL... INCREDIBLE rates... the HOLIDAYS are around the corner... give the gift of a Fifi Flowers TREASURED painting!!! Nowwwwwwwww be sure to visit other Outdoor Wednesday participants via A Southern Dreamer! See you tomorrow in PARIS!!!! How cute!!! I think the donkey looks a bit cheeky!! Very sweet!! Well this certainly feeds into my love affair with goats! That may be one of my most favorite works of art. Love these farm animals. You are so talented. FIFI DEAR! THANK YOU FOR STOPPING BY!!!! your work is as gorgeous and bright as ever! I am picking up my pencil again and go to my other blog, HOT OFF THE PRESS and see my fox terrier; he is part of a story that I wrote last year. Please come! Anita I LOVE GOATS!!! Awwwwww, these are wonderful, darling FF! Fifi you are so talented! Both the goats and donkeys have such personality! Hehe I love the last one. Too cute! Fifi, thanks for your recent visit. It's always nice to hear from you. Your drawings of these out of the ordinary pets are adorable. I need to get an idea together for a friend's gift. I'll be in touch. These are adorable! I can't decide which one I like the best! I saw one donkey at an auction. He was gorgeous! I asked him why are you here? He took the treat I gave him and munched away. 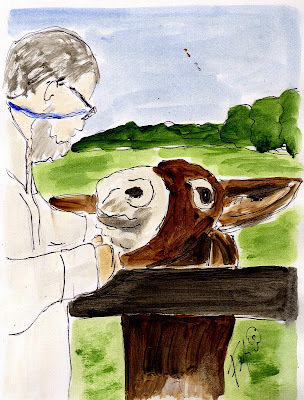 and asked him the same question but the donkey wanted more treats and began to he haw so loud. I got my answer as to why he was there. lol poor guy. 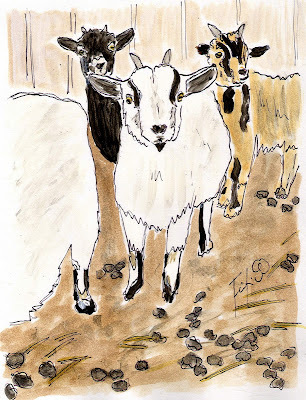 I used to have a herd of dairy goats...milked them twice a day made French Chevre cheese from the fresh milk...so your little goat painting made me smile. I love your farm paintings Fifi! They are great! 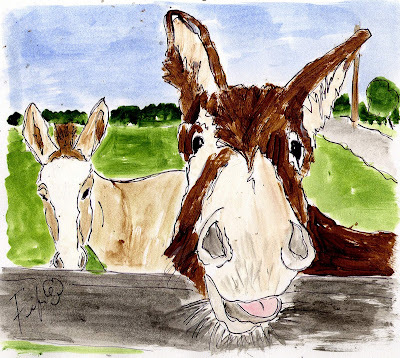 I love the personality of the donkey in the last painting! Those are adorable! Thanks for letting us know and thank your your kind visit! These farm animals are so precious! Such rustic charm.